Eleanor McManus, upright daughter of a minister, is rescued from kidnappers by a rough and tumble fur trader, Beauregard Gentry, in the wilderness of northern Virginia. With Beauregard’s help, Eleanor makes her way back to her intended groom who declares her soiled, and she finds herself alone, pressured to make life decisions without benefit of family or others she can trust. Beauregard and Eleanor agree to begin a life together, build their legacy together, and their growing devotion to each other is witnessed one cold, crisp Christmas morning. This novella was originally included in the anthology Christmas in America. Into the Evermore is available now in ebook format for 99 cents on Amazon and Barnes & Noble. 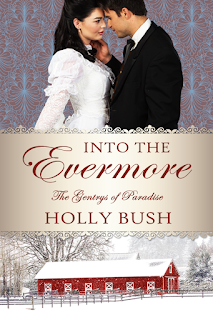 Add it to your shelves on Goodreads, and visit Holly's website for the scoop on all of her books.